The Diaper Train improves the lives of babies and toddlers by providing diapers to low-income families in Wake County. It is the only diaper bank in the county. The program is run by volunteers and serves 1,000 children each month. From 2011, its first year in operation, to 2014, the number of diapers distributed rose from 65,000 to more than 650,000 per year. The Diaper Train partners with the Department of Human Services, SAFEchild, StepUp Ministry and other agencies to identify families in need. 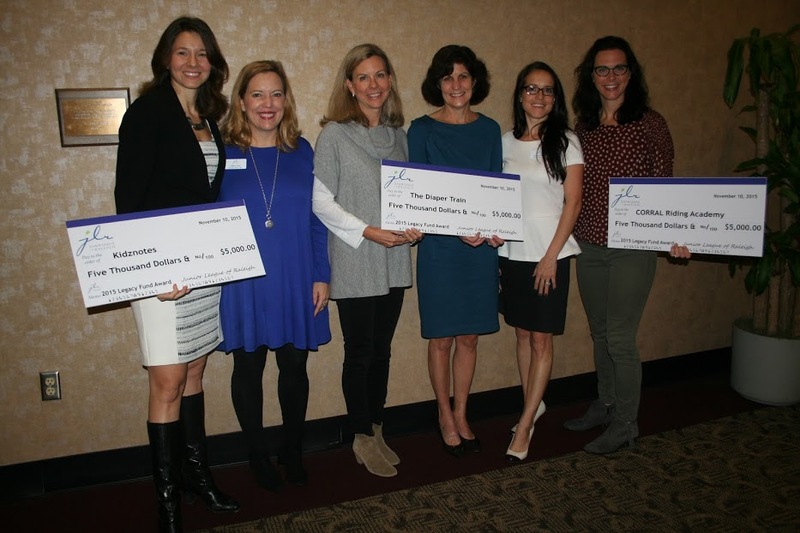 “The Junior League of Raleigh Legacy Fund Award helps The Diaper Train, a program of Saint Saviour’s Center, address a gap in services for low-income families in Wake County,” said Allene Adams, co-founder of The Diaper Train. “Demand for diapers has exceeded our expectations, challenging us to expand funding so that we can assist additional families. Forty-seven children will receive diapers because of this grant.” For more information, visithttp://diapertrain.org. Kidznotes changes the life trajectory of elementary school students living under the poverty line in Southeast Raleigh by providing orchestral instruments and accompanying lessons. The program encourages discipline, teamwork and leadership to increase musical proficiency, academic performance and personal/social development. Since 2010, the program has grown from 60 to 240 children in the Triangle. “Thanks to the support of the Junior League of Raleigh Legacy Award, Kidznotes is able to continue to grow and sustain our impact on the underserved youth of Wake County by removing any and all barriers to participation in music education. Although rooted in low-income communities, we believe that opportunities should not be dictated by circumstance,” said Katie Wyatt, Kidznotes co-founder and executive director, “By making this commitment to Kidznotes, the Junior League of Raleigh is making an important difference in the lives of young children and in the continued health of our community. ” For more information, visit http://www.kidznotes.org. CORRAL pairs rescued horses with at-risk girls between the ages of 11-17. A majority of these young women have been victims of violence, and many have been gang or court-involved. Founded in 2008, CORRAL offers academic tutoring, psychotherapy, vocational training, mentorship and social education free of charge for 15-20 hours a week. CORRAL enables teenage girls to become successful adults through a minimum one-year commitment that in many cases lasts four to seven years. “This generous award will allow CORRAL to serve one young woman in the community for an entire academic year,” said Joy Currey, President of CORRAL Riding Academy. “Participation in the program will change her life- forever. She will receive over 600 hours of tutoring, therapy, mentorship, vocational training and skill building during the year by licensed professionals and loving volunteers. ” For more information, visit http://www.corralriding.org. The Junior League of Raleigh is the local chapter of the Association of Junior Leagues International, an organization of women committed to promoting volunteerism, developing the potential of women and improving the community through the effective action and leadership of trained volunteers. Its purpose is exclusively educational and charitable. The Junior League reaches out to women of all races, religions and national origins who demonstrate an interest in, and commitment to, volunteerism. Now in its 86th year, the Junior League of Raleigh boasts nearly 1,600 women supporting community organizations around Wake County. For more information, visit www.jlraleigh.org.